This easy DIY travel Air Conditioner, is an energy-efficient AC unit, that can be built in about 10 min to build for less than $35! It is perfect for pets, garages, RVs, converted van’s, and road trips. It’s cooling power comes directly from frozen ice, and electricity is not required. Depending on which type of fan you choose, it can be battery powered, or electric powered. We used a small personal fan that runs off just 1.5 amps, and plugs directly into our 300 watt solar system, in our Sprinter van. This is also the same air conditioner that allowed baby to nap peacefully, while we drove through Redding, CA. At peak sun, in 110 degree heat. As well as many summer beach camping trips. If you travel with your pets during summer months, a DIY Travel Air Conditioner is the perfect thing to keep them cool when you’re parked. This air conditioner kept our pup cool and comfortable sleeping in the van all night, when we stopped in no man’s land at a No Dogs Allowed hotel. When starting this trip in December, we were dreaming of snow, and snowboarding, and cold, and rain. The van did not come with working AC, but our focus was on heat, and keeping our new little one warm and snuggly. While considering options, we made-do by bundling up, and running a temperature controlled electric heater. This worked great when we were able to plug-in to campsites and friends/ family’s places. This was the only way we could run the heater. It sucked entirely too much energy to work with our small 300 watt solar set up. Then the seasons changed, we pushed heat back as a project for next winter, and started moving our focus towards air conditioning. If it were just the two of us, we possibly would have put that off too, but a hot baby makes naps hard to come by. When baby doesn’t nap, we all (including the pup) loose a bit of our sanity. It feels like the van gets smaller in the heat. Especially when we are in route and not able to stop, open the doors, and spread out. Things get a little edgy in our tiny space. In an effort to keep morale (and our sanity) air conditioning moved up to the top of the necessity list. With the education of Youtube, The Husband fashioned our own simple air conditioning unit after this video. I saw another design that used more than 1 pvc pipe, which allows cold air to blow multiple ways, but this single pipe design is working good enough for us at the moment. How to build an easy DIY travel Air Conditioner in about 10 min, for less than $35. No electricity required! Fit the pipe and fan into the holes. When the AC not in use, the pipe and fan can be easily removed, and stored inside the ice chest, to save on space. 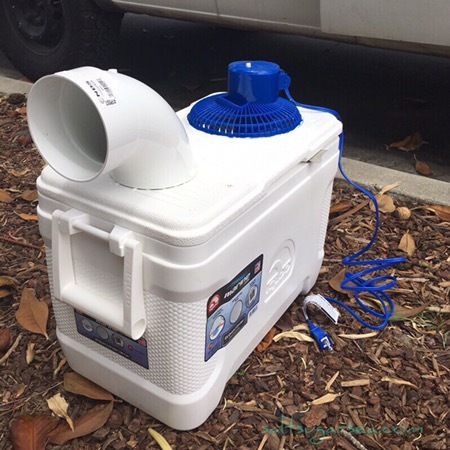 If traveling in really hot weather, try this trick to extend the life of the ice, and keep your DIY Travel Air Conditioner blowing cool air longer. Extend the life of that quickly melting ice, by adding a little extra insulation. I recommend Patagonia nano puff jackets, if you have any. We wrapped our AC with them while road tripping through Arizona in August, and it greatly extended the life of the ice. Otherwise, simply wrapping the ice chest in towels, blankets, or whatever u can get your hands on, will still add some extra insulation. I suppose you also could go with a better ice chest, but I couldn’t bring myself to cut holes in something like a Yetti. But maybe it would make this diy AC work really good? Maybe that will be a future challenge. Tho hard to find in stores anymore, ice BLOCKS last 3-4 times longer. If your able to, reuse milk, or juice jugs . Just wash out thoroughly. Fill almost to the top with h20, leaving a cpl inches for expansion, and freeze till SOLID. You can also insulate each individual frozen jug to help them last even longer. Just unwrap one or two on top of the remaining wrapped jugs. And you should still have ice at the end of the day. 1) How much ice, by weight, do you need? I found that ice bags vary by weight depending where you buy them. 2) How long does the ice last on a hot day? 3) In humid weather, does it still work as well? And does it get stuff inside damp? I am wondering if a powered exhaust fan in the roof of the van would also help in removing excess humidity. So it works for sure, but it’s not necessarily going to cool your whole space in extremely hot weather (90 +). In those temps, you pretty much need to be directly in front of it, or in a very small space to benefit from it. In 80 degree temps, we were able to cool the entire van to a comfortable temp. How much ice you need depends on the size of your ice chest, always fill it full. Ours held about 2 and 1/2 bags, so 20-30lbs. Driving through AZ in 100 degree temp, we were re-icing every couple hours. Urban camping in San Diego with over night temps of 86, we still had some ice by morning. Wrapping the ice chest for insulation helped keep it frozen for much longer too. Hope that helps! And at any rate, I’d say try it, it’s better then nothing and the price is worth it!